at 1424 North Las Palmas Avenue, Los Angeles. The Las Palmas Four has a total of 4 units. 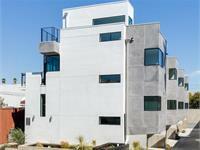 A modern community featuring 4 architectural residences. Experience contemporary floor plans and stunning city views in the epicenter of Hollywood. Your inquiry will be delivered to the The Las Palmas Four sales team, who will send you more information about this development.